We know how difficult it is to find a really good groomer... It's so important to you that the grooming specialist in whom you put your trust, not only styles your pet to the highest standard, but handles him or her with loving gentleness. It is like taking your child to school for the very first time - you want the teacher to give them care and comfort, and a lovely day! Our fully insured salon is equipped with the latest grooming facilities and top-specification grooming products to indulge your special furry friend. Our number one wish is your and your dog's happiness, and the pleasure that YOU will gain from proudly showing off your beautifully groomed pet to everyone you meet! 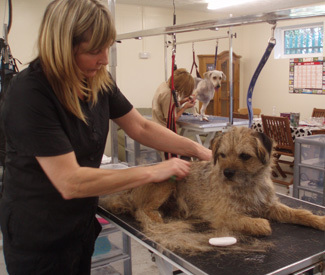 We also welcome suitable 'model dogs' to be groomed for half the usual price by our students. All students are closely supervised by their tutor. If your dogs coat becomes matted it will be very uncomfortable and can even constrict blood supply to the legs and tail! Attempting to brush out mats is painful for your pet, and because The Groom Room has your dog's best interest at heart we have a 'shaving policy'. 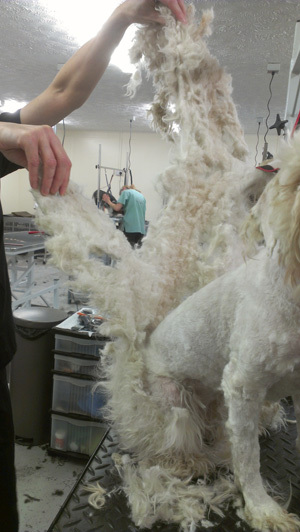 If we think your dog's matted hair needs to be shaved we will discuss this with you first. It is a time consuming and specialist process and we will charge extra for this service. Shaving matted hair often reveals red itchy or sore skin. This is caused by the condition of the coat and not by shaving. We will use gentle, soothing shampoo, and we may advise you and seek veterinary advice. We ask that our customers regularly treat their dogs with vet approved flea and tick product. We do not routinely treat dogs for fleas and do not accept dogs into the salon carrying fleas. If we find fleas on your dog after they have entered the salon we will carry out an emergency treatment to prevent spread in the salon, and we will charge you for this treatment. You will still need to apply flea prevention treatment at home. Here at The Groom Room we groom to please YOU, so your requests are welcome. All your dog's special needs are catered for, be they puppies, seniors, nervous or bold. Feel free to browse our gallery for before and after photographs of some of our previous customers. Open Monday to Friday, 8.30am - 5.00pm. 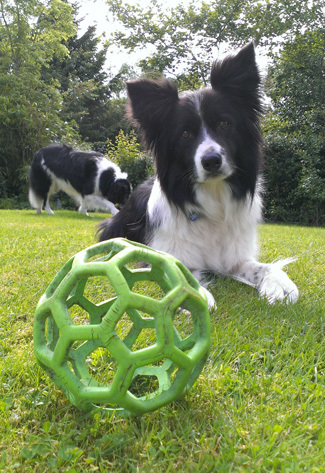 Prices tailored to each individual dog to offer you the very best value for money. We operate a "less than 24 hour" cancellations policy where a fee is levied to help cover costs in the event that we are unable to replace your booking at short notice.